The Serene Stamper: Big Shot Class a ton of FUN! Big Shot Class a ton of FUN! Helen's first time using the Big Shot! Suffice to say, she LOVED it! Bag-a-lope - cased from Dawn Griffith. All our projects were ones that I found online and I just copied the original idea and tweaked it by using the DSP I had on hand, etc. This saves me a TON of time which makes being a Stampin' Up! demonstrator easy, fun and of course, rewarding! 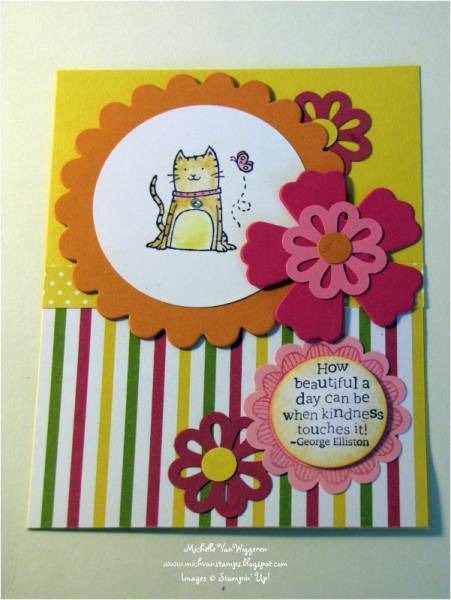 You don't have to re-invent the wheel - there's a gazillion sources of inspiration available (online, in our Stampin' Up! cataologues, the demonstrators website, etc). I hope you find some time and INSPIRATION to stamp something fun today and pop a cute card in the mail for no reason at all other than to let someone special know you love them. Have a terrific weekend and HAPPY STAMPING! PS - There are only THREE days left to get in on the $119 promotion and FREE Christmas Keepsake Kit!! Contact me today to get YOUR package of Stampin' Up! products ~ this is too good an offer to refuse! Here's everything you'll get and it's customizable too so you can change the stamp sets and ink pads, etc to ensure you get exacatly what you want! How cool is that??? LOVE IT! FREE Christmas Keepsake Kit Included! This is a $50 value and it's GORGEOUS! 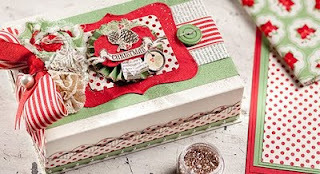 The new holiday stamp set is beautiful too and can be used for your Christmas cards, gift tags, home decor, etc. *From the 2011 Holiday Mini Catalogue!